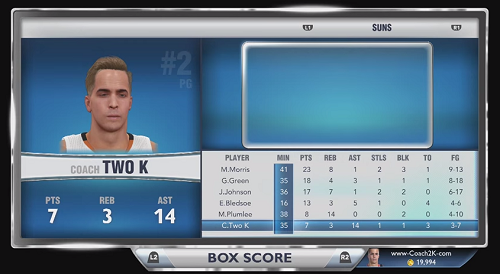 In NBA2K15, I thought I would start playing MyTeam mode. But, I don't know a whole lot about it other than it has a reputation of being a 3 point chuck fest. So, I sought out some information on the MyTeam mode and found Scramz B posting over on the Operation Sports forums. He seemed fairly passionate about the mode and was nice enough to come onto On The Court With Coach2K and discuss it with me. Scramz B is on the Xbox so we weren't able to play our customary podcast "pre-game" unfortunately so we got right into our discussion. He was able to clear several things up for me regarding what the mode is all about and also share with me exactly how to go about getting started the right way. He also went into detail about card collecting, the pack system, historic cards and more. In addition, he shared with me the expected changes in NBA2K15 that is going to be released on October 7. His most requested change in the mode would be to be able to customize the settings in play with friends mode. I hope you enjoy this episode of On The Court With Coach2K. You can now subscribe via iTunes. If you'd like to discuss more MyTeam info, use the comments below and we can talk about it more. Thanks for listening and I'll see you On The Court! 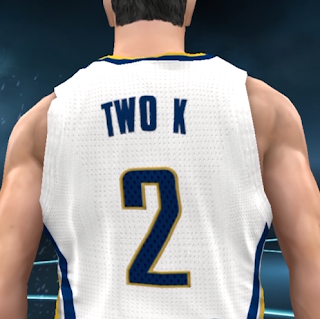 In this episode of Coach2K, I interview PSN Turty11 who has spent the last couple of years working on his roster editing skills. We spend our time talking about where to begin if you want to start editing your own rosters and what sources he uses to get his data. We also spend some time talking about ratings, tendencies, signature skills and the personality badges and how he feels NBA2K is going too far away from the way he'd like editing players to work. Near the end we also talk about draft classes and he agrees to make a community draft class of 15-20 guys in the community that he can import into NBA2K15's MyLeague or MyGM to see what happens when 2K decides what will happen with our careers. As a guy who doesn't edit rosters and is more an "out of the box player", I wanted to give a voice to those who like to get in there and really tinker. I'm sure we only scratched the surface of a very arduous and lengthy process if you really want to do it right. Thanks again to my guest PSN Turty11 who you can follow on Twitter and also another shout out to Aaerios Gaming for doing the intro to On The Court With Coach2K. Enjoy and let me know what you would like to hear on the show. Post any comments below and I'll be sure and read them. 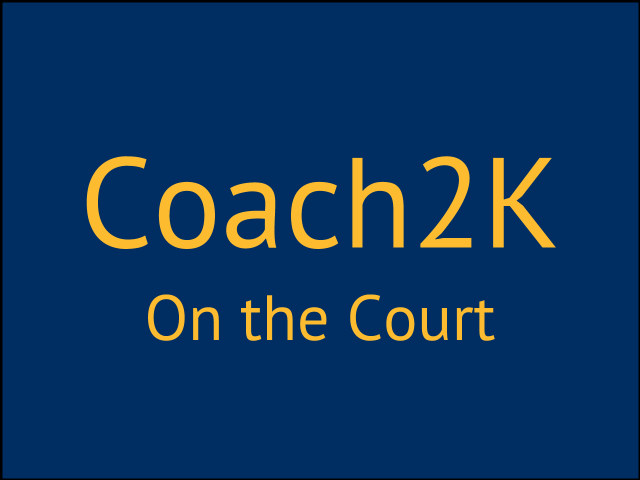 In this first episode of On The Court With Coach2K, my guest is PSN RedStickGamer. He is the owner of the New Orleans Pelicans in the Coach2K League, the NBA2K14 C2K League Champion and he is also one of the best 2K team up players I know. At the time of this show, RSG was competing in his teamup league's finals which he is posting on his YouTube channel. Teamup is a mode that not a lot of people play. Some might not even know it's there, especially private team up which is the mode that is used to play the team up league games. I spend about an hour talking about RSG about the teamup mode basics, tips and strategies along with what's happening now with the teamup league championship series between his team's Lakers and the undefeated Oklahoma City Thunder. Thanks to Aaerios Gaming for the great introduction! Be sure and check out his YouTube Channel for his unique and excellent video game commentary. You can follow the RedStickGamer on Twitter. If you would like to be "On The Court With Coach2K" or have a show idea you can hit me up on Twitter. Enjoy and I'll see you on the court! The video posted below is a result of a lengthy discussion on the Operation Sports forums I participated in a while back about how you "had" to play in MyCareer mode in order to win - especially on hall of fame difficulty. The consensus was that in order to win in MyCareer on hall of fame difficulty, you had to dominate statistically and also had to have loaded up your MyPlayer with high attributes and signatures skills as well. 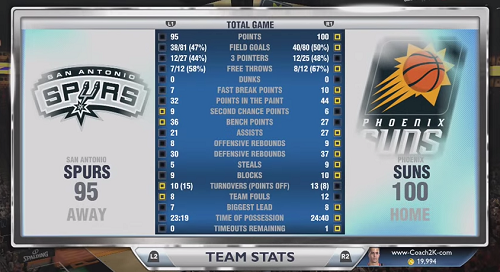 That was accompanied by the usual stuff said about how the HOF CPU cheeses and your guys don't hit shots etc. When I saw this discussion, I had to ask myself this. Do the posters really know what they are talking about? Only then could I agree with what they said. So anyway, like I usually do, I stir up the emotions when I get involved questioning some of the things some people posted and stated as fact that while maybe what they posted was true for them - it was not necessarily a fact. In stating my opinion, the usual problems develop. It was said that I haven't played the mode long enough. They said that until I played over a 100 games in MyCareer, I should just keep my mouth shut since I couldn't speak as an authority unless I had. By the way, I had. These are the main problems that most people see when they play MyCareer mode that lead people to think that you have to totally do everything yourself in order to win. The MyCareer story line encourages you to dominate The first issue with MyCareer is that game presents these goals and challenges through the story line, social media challenges and in game suggestions. These goals are usually centered around you. Let's face it. It's a "me" centered mode. So when the game tells you what to do, it seems logical to think the game must be providing you good instructions to follow. Otherwise, why would it tell you to play that way? The players on your team let you down You work hard to get your players the ball and get them shots but when you do that, your players don't succeed. And these are guys that SHOULD succeed. When they don't, it reinforces the instructions the game gives you which is to do it all yourself. 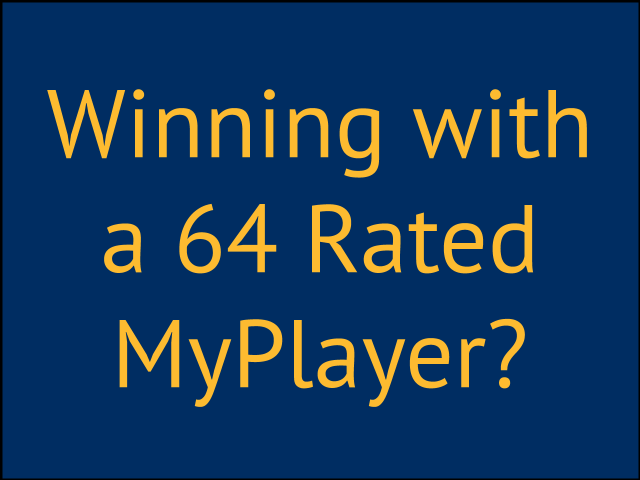 It's too easy to upgrade your player Most people can't resist the temptation to upgrade their MyPlayer. Quite honestly, it's probably way too easy to make your player better without making yourself better first. What's interesting about upgrading is that you can change the gameplay difficulty without changing the storyline difficulty. The storyline is easy. Playing the game can be hard. They don't work together. These problems are at the heart of what makes MyCareer mode frustrating. If you want to have the most fun with the MyCareer mode, realize that it's best to go all out for YOU and to dominate. That's the purpose of the mode. But just because it's the main purpose doesn't mean you have to use it that way. It is possible to have a different experience in MyCareer if you want to approach it differently and you don't have to totally dominate gameplay to do it. Here is how I suggest you deal with the problems in MyCareer mode. Believe you can do it The first step is to believe it is possible to get a different kind of game out of MyCareer if you play differently. You have to be open to the fact that maybe your playstyle can make a difference in the results you get and that maybe the playstyle you are using is not the best playstyle to use. Most people fail to look at their own play as critically as they do everyone elses and it's easy to blame the game. The game plays the same across all modes Recognize the game is the game. Good quality play translates on the floor regardless of what mode you are in. Are there moments in MyCareer where things have to happen to complete the story? Sure. Otherwise, the game is the same game you play in all other modes. Ignore what the game tells you to do The next thing you need to do is forget what the game tells you to do and do what's best for the team. Just because the game says you need to do something, doesn't mean you have to do it. If you don't meet a challenge and yet the team still wins, isn't that more important? The next game still comes as scheduled. Control the game not the stats Focus on controlling what happens in the game and not on stats. This means you have to learn what each player on your team can and cannot do and evaluate what you can do to get them the ball where they need it. If a player on your team continues to miss shots in certain situations, it means you need to rethink what to do in that situation. It doesn't mean you need to score although sometimes it might. It might mean you need to give the ball to that player in a different way or at a different time. It might mean you need to give it to someone else. Use the team you are on in MyCareer outside of MyCareer To really understand what your teammates can and can't do, use that team in other game modes to learn how to use each player's strengths and weaknesses. Focus on your teammate grade more than your stats Rather than focus on stats, focus on getting an A+ teammate grade. It's not perfect, but assuming you aren't just manipulating the grade, the better your grade, the better the game. This means you have to contribute on offense and defense. Upgrade at a more realistic pace There's no reason to upgrade so fast. Just because you can upgrade doesn't mean you have to. Set a pace that you want. Understand it's a superstar mode Because most people play the mode to become a superstar, the better you play, you'll eventually become a starter. The rotations and minutes are programmed to get you in the lineup. I figured the best way to find out if you could win without dominating was to get to work and see for myself. I attacked this project using the steps I listed above and to do basically the exact opposite of what most everyone else does when they play MyCareer. I started a new MyCareer file and created a pass first, 64 rated MyPlayer. I decided not to upgrade him at all. I didn't upgrade a single attribute and I didn't add a single signature skill. The only thing I did do was add some personality badges once they were unlocked. I ignored all of the things I was told to accomplish and just tried to play good basketball. It was kind of hilarious because my guy couldn't dunk, couldn't shoot and couldn't play defense at a high level - pretty much like me. I got my minutes up. I then posted a video of one of my games in that thread over at Operation Sports showing what was possible. However, that video was discounted because my guy didn't start and supposedly, he didn't play enough minutes because he was a role player. OK. Fair enough. If your guy isn't out there on the floor, he can't really claim credit for the win. I decided to play more games until I became a starter. I then recorded yet another game and then posted that video in the thread showing how you can "choose" to play and have good results with a low rated player - without dominating statistically - and still win. You'll notice that not only did my Suns team win the game, they also outplayed the Spurs in nearly every category. My line in the game is below. I didn't shoot a three or dunk and didn't even score in double figures. My teammates on the other hand helped the team shoot 50 percent from the floor and nearly 50 percent from three for the entire 12 minute quarter game. You can watch the whole game in it's entirety. The video is at the bottom of this post. Now in the video I posted below, I'll be the first to admit that I could have ran a better offense, but I know that once I know the team better, I could run plays and repeat exactly what I did in that video. How do I know that? Because I've spent hundreds and hundreds of hours playing the game and I've also seen video evidence of others having success. This is the approach you should take when people tell you what's impossible with the game. You should test it yourself and exhaust every tool the game gives you and apply it before you agree. Further, if you see video of someone proving that it can indeed be done, then that should be evidence enough that it can be done and that you can also do it. You need to study that video evidence carefully and compare it to what you are doing. Regardless of how many people complain, IF someone shows what can be done, that means it is repeatable by others. Even if, a million of people come through screaming otherwise. Personally, I think video evidence showing something can be done should end most arguments but there is always some reason why that is not the case. And that reason is usually the person denying it's possible based upon their own experience telling them it's not possible. I agree, and it might seem contrary to what I should say here but usually everyone is right in these debates that I get into. Those who don't think it's possible because of what they see, they really do see it. But what causes what they see? Is what they see a result of the way game works or can their play cause the problems they see? Many times, their play can be changed to get different results. And so the mindset you need to have is one that's open to thinking your play might have a greater impact on what you see than you think. There was a day that I believed that you had to dominate statistically to win in MyCareer and that my teammates were stupid - until I changed my approach. That being said, I didn't say doing what I did was easy. Keep in mind, it's actually pretty tough to do. But being hard to do is certainly different from being something that can't be done. If it's too hard for you to do on hall of fame that should tell you that you should reduce the difficulty or deal with it until you can improve your play to that level. Also realize that if you are reading this that I'm not that great of a 2k player. If we played a head to head match, you could probably beat me. That should tell you that if I can play MyCareer and win without dominating, and you can probably beat me, then you already have the skills you need to do it as well. Kudos to the guy who I got in the debate with originally for recognizing that there was some pretty good defense played in the game that I played in the video and for maybe being willing to consider that it is possible to win without dominating if you rethink your approach and take a different mindset on the floor with you. Good luck and I'll see you on the court! Feel free to contact me for a game. Here's the complete game video.